The odd year election cycle of 2009 is fast approaching with two gubernatorial races entering the national scene. New Jersey and Virginia will steal the '09 spotlight, but several large cities will conduct mayoral elections and at least one House Seat will be up for grabs. The depth of public polling is however limited to the two Gubernatorial elections for the moment, and I don't suspect this will change. I've compiled gubernatorial election polling released so far in 2009 and applied our projection methodology. The resulting conclusions, along with each poll, is depicted in the graphs below. The graphs are dynamically updated upon the inclusion of a new poll, and embeddable. The complete list of polling data is available on our Polls and Graphs page with the gubernatorial elections prefixed with "2009" on the Race drop down list. I've got two quick pieces of analysis, one for each state and I'll preface my comments by stating that I know very little about each state and next to nothing about the candidates. I can however provide demographic and historical perspectives. 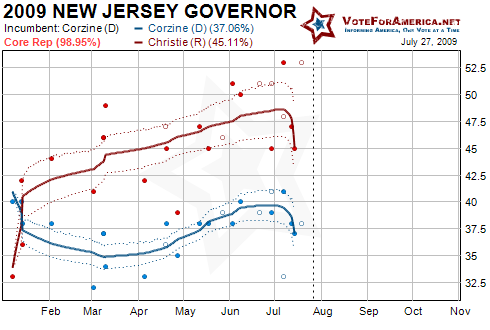 Let's begin with New Jersey; Democratic Incumbent Jon Corzine currently trails by about 8 percent. A back-analysis of our 2008 Senate projections reveals that just two candidates overcame an 8 percent deficit in mid-July and they were both the challenger rather than the incumbent; Hagan (D) in North Carolina and Merkley (D) in Oregon. A Corzine victory would not be unprecedented, but given the political environment of an odd year election, where nobody cares, it seems unlikely. Our model currently gives Corzine just a 1.05% chance of victory. Virginia features a much more competitive, incumbent-less field in a state trending heavily blue. 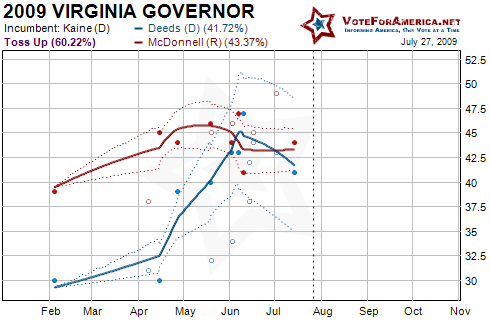 The Republican Candidate, Bob McDonnell currently has the upper hand as Creigh Deeds' primary bounce seems to be subsiding; but with that being said, neither candidate has obtained inevitability. The biggest wild card in this election will be the contribution of the Democratic National Committee which is currently chaired by the present Governor of Virginia, Tim Kaine. If Deeds and Kaine can effectively leverage the Democratic base in Virginia, they should easily win. McDonnell's strategy is simple, stay ahead and hope election fatigue sets in, thus diminishing Democratic turnout. In either case, the victor of the next month will likely be the victor at the end of three months. I'll post a polling update every Monday from now until November 3rd with the latest polls and analysis pertaining to the two gubernatorial elections of 2009. If another race produces fluid polling data, I'll incorporate that data as well, but I just don't see it happening.